Diana married young, then left her husband for the British Union of Fascists leader Oswald Mosley, and was put in prison for three years for her beliefs; she was also one of the few people who knew both Churchill and Hitler. There was Unity, who moved to Germany in 1934 at the age of 19 and became devoted to Hitler, whom she got to know well; her dual loyalties to the Führer and her country caused her to attempt suicide by shooting herself in the head at the outbreak of war. Jessica, known as Decca, became a communist and ran away at the age of 19 with Esmond Romilly, Winston Churchill’s nephew, and then moved to America. After Romilly’s death she married again and wrote several books, including The American Way of Death, which changed the way people felt about the funeral business. And there was Debo, the youngest. ‘Everyone cried when you were born,’ Nancy, 16 years older, would enjoy reminding her (their mother had wanted another boy). Nancy went on to tease and torment her until it came close to bullying. The children all had pets – Decca had a sheep called Miranda, Unity a goat, rats and snakes, Debo had ponies, dogs, guinea pigs and hens. The younger girls had extraordinarily close relationships with each other, and their own private languages; all the sisters had a complicated variety of nicknames, and, later, political alliances and rivalries (except for Debo and Pamela, who remained apolitical). The best and most revealing book about the Mitfords is Letters Between Six Sisters, 75 years of letters masterfully edited by Charlotte Mosley, Debo’s niece, published two years ago. 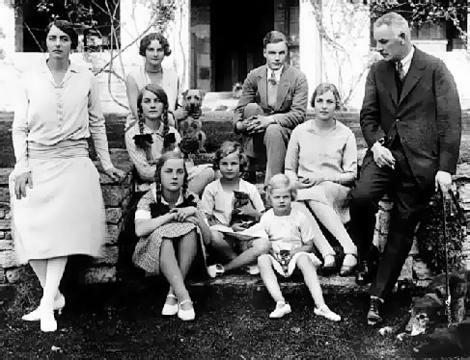 They all had the Mitford voice – relentlessly upper-class 1930s, and their own particular imperative way of speaking: ‘do miss me’, ‘do say you’re thrilled’, ‘do be sorry’, ‘you must say it’s funny’. They toyed with words constantly, and invented nicknames that robbed people and things of their status – in Nancy’s hand Mein Kampf became Mein Comf and then Mein Uncomf; Sir Oswald Mosley was Cyril, Sir O, the Great Leader or simply Lead; Queen Elizabeth the Queen Mother was Cake; Nancy herself was known as French Lady Writer. As a teenager, Decca had always had a Running Away bank account and became increasingly dissatisfied with her life and enamoured of the idea of communism (she and Unity would partition the schoolroom at Swinbrook, scratching swastikas and hammers and sickles on the windows). When she met Esmond Romilly, who was her second cousin, she had already fallen in love with his reputation, and they made surreptitious plans to go to Spain where he would report on the war against Franco, Decca going along as his secretary. Under the pretence of going to stay with friends, Decca went to France but they couldn’t get a visa for Spain, and for a while her family had no idea where she was or with whom. Nancy and her husband were sent to bring them back; they refused to come. By the time they returned to England, they were married, and in 1939 Decca moved to America with Romilly. She remained there after his death in 1941, marrying again, coming back only occasionally to England. But after 1937 Decca never saw her father again. Farve, faithfully portrayed as Uncle Matthew in The Pursuit of Love, was prone to ‘roaring’ at everyone. On her birth certificate, according to Nancy, it gives her father’s occupation as ‘Honourable’. He enjoyed the occasional ‘child hunt’ where he would chase his two youngest daughters with bloodhounds, he was rude to all Nancy’s friends who came to stay (‘Don’t these people have homes to go to?’ he would shout to his wife across the dinner table), and a man he didn’t like was a ‘sewer’ or ‘a pointless piece of meat’. He had a horror of anything sticky, and Debo once asked him what his idea of hell was. ‘Honey on my bowler hat,’ he said. Irascible, unreformed and very dry, he made a great double act with Nancy. Did he know he was funny? ‘Oh, yes,’ Debo says, ‘but people didn’t know how to take him because he was completely deadpan.’ The sisters loved him but they would gently tease him; they called him ‘The Old Subhuman’ or ‘The Poor Old Male’. Decca would shake his elbow while he was drinking his tea so he could practise for when he had palsy. Her brother, Tom, went to Eton but the girls mostly didn’t go to school – their father believed that they would be made to play hockey and might develop thick calves. Sydney taught them until they were six; she then engaged governesses, which she paid for out of the profits she raised from selling eggs and honey. By the time the last two sisters were teenagers she had relented slightly; Unity went to two schools (and was expelled from both) and Debo went to one for a week (‘It smelt of lino and fish and girls’) where she was so unhappy that she fainted in geometry and was sent home. Muv was a meticulous housekeeper who lived very frugally and recorded everything. After Debo became the Duchess of Devonshire in the 1950s and moved into Chatsworth, it became clear that she had inherited some of Sydney’s skills at household management. Debo partly wrote this book, she insists, as a way of correcting what other people had written about her parents. ‘People who never knew them. I wanted to put it straight, and then of course it burgeoned into a much bigger thing.’ Her mother particularly has been portrayed over the years in books – some by her own daughters – as distant and vague, even callous if you believe Nancy. ‘People always thought my mother was miserable because of the things my sisters had done but she used to say, “I am perfectly satisfied with all my children,”’ Debo says. By this time they were living in a small cottage near High Wycombe. Even though Debo was 19 and unofficially engaged to Andrew Cavendish, it affected her very much. ‘There really wasn’t room for two people with such diverse views so they quietly went their own ways, but they still wrote to each other.’ Farve, who was something of a shadow of his former self by then, moved to Redesdale Cottage in Northumberland with their former parlourmaid Margaret Wright. ‘She was a very boring woman, very ordinary,’ Debo says. Unity never recovered enough to live an independent life. She died in 1948 after an infection of the wound in her head turned into meningitis. They were married at the church of St Bartholomew the Great, Smithfield, in April 1941. Andrew was serving with the Coldstream Guards, and Debo moved around with him and then to a cottage in her parents-in-law’s estate, Chatsworth. The war hit her hard; she lost her only brother, her four best friends, and in 1944 Andrew’s older brother Billy, Marquess of Hartington (who was married to Kick Kennedy, JFK’s sister), was killed and Andrew became the heir to the dukedom. Andrew’s father, the 10th Duke, set up a trust, the Chatsworth Settlement – the law at the time stipulated that five years had to pass from the date of handing over the property for it to become free of death duties. But in 1950 he died of a heart attack, 14 weeks before the five years was up, and Andrew became the 11th Duke with an inheritance subject to death duties amounting to 80 per cent of the worth of his estate: £4.72 million, with interest to be paid at a rate of £1,000 per day. Apart from Chatsworth, the estate comprised Hardwick Hall in Derbyshire, Compton Place in Sussex, Bolton Abbey in Yorkshire – and their contents – and Lismore Castle in Ireland, which he already owned. The Duke decided to hand Hardwick Hall over to the Treasury (it is now with the National Trust), and to sell thousands of acres in Scotland and Derbyshire. He also sold books and many works of art to various national institutions, though nothing left the country. The final debt was cleared in 1974. Chatsworth last year attracted more than 623,000 visitors; it is one of the most popular country houses in England. Debo has played a huge part in its administration and all its initiatives. The two achievements at Chatsworth of which she is most proud are the Farmyard, which she instigated in 1973, a very avant garde idea, now very fashionable – to show town children how the country worked and where their food came from. ‘The city children were amazed and so were their teachers because they were the first generation of teachers who hadn’t got relations in the country.’ And 1977 saw the establishment of the Farm Shop, also way ahead of its time. In 1991, for their golden wedding, the Duke and Duchess asked everyone in the county whose golden wedding anniversary fell the same year to a tea party – 3,700 people attended. This was a typical gesture; there is very much a feeling that they created a sort of magic kingdom during their reign at Chatsworth. Debo has an extraordinarily youthful spirit, and she is, says an old friend, just as impressed by the local milkman as by JFK. This is borne out by the fact that at one point she had a tramp living in her barn for several years. She also got to know JFK quite well, and says he was one of the funniest people she ever met. ‘He was so quick, and he made such fun of other people, but in such a nice way that they didn’t mind.’ She met Kennedy at a ball in 1938, and later became close friends with him; he would often ring her at 3am to chat, and she and Andrew attended his presidential inauguration in 1961 and, in 1963, his funeral. There was alcoholism in his family – Andrew’s uncle Charlie died of it at the age of 38 – and Debo says that drinking also contributed to his father’s death at 55. Andrew was an angry man and Debo describes one period of their life as ‘like walking on eggshells’, waiting for that anger to flare up when he was drunk. Advised by her family and Alcoholics Anonymous counsellors, she explained to his loyal employees that Andrew was suffering from an illness that was alcoholism, and asked for their support. He gave up drinking twice – once in the 1970s for two years, and again for a short time in the early 1980s. In 1983, after a particularly terrible weekend when ‘Andrew’s behaviour was out of control’, she left Chatsworth and went to stay with her son, agreeing to return only if he stopped drinking. He did, with the help of the drug Antabuse, and never drank again. He died in May 2004, aged 84. Debo never stopped appreciating Chatsworth. ‘Waking the first morning in the bed I was to come home to for the next 46 years and one month was a joy and I never tired of the incomparable view west across the park,’ she writes. ‘In all those years I never took the place for granted, but marvelled at it and the fact that we were surrounded by beauty at every turn.’ She stayed on there for 18 months after Andrew’s death, and then decided it was time to go, handing it over to her son Peregrine, the 12th Duke, and his wife, Amanda. ‘I was 85, it was high time to go and high time for the others to come.’ She now has eight grandchildren (the model Stella Tennant is one of these) and 17 great-grandchildren, and they all adore her. The Dowager Duchess of Devonshire has her own exhibition at Chatsworth, in celebration of her 90 years. There is a display cabinet with her diary open at the page where she writes about having tea with Hitler in 1937. 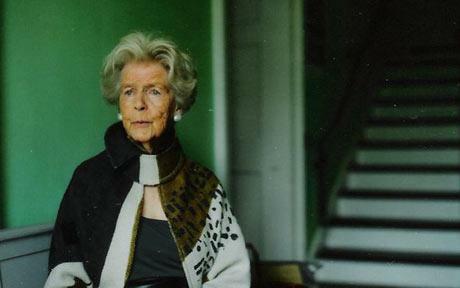 There are paintings and photographs of her – by Cecil Beaton, Mario Testino and Bruce Weber – and some of her clothes on display, including a Philip Treacy hat, dresses by Dior and de la Renta, a bouclé skirt by Givenchy, and her trademark uniform in the 1980s and 90s, wool cardigans by the Natural Dye Company. There is her collection of insect and spider brooches, and also what can only be described as an Elvis shrine, including a piece of picket fence with a nail that may or may not have been knocked in by the man himself. She has been to Graceland three times, once in the company of her son and daughter-in-law (‘I don’t think they were terribly impressed’), who were in Memphis for an exhibition of works of art from Chatsworth, and once in the company of people from the Metropolitan Museum of Art in New York. ‘By far the most amusing thing was seeing them peering at the records which line the walls. They got out their little jewellers’ glasses and they might as well have been examining a Vermeer. ‘Would you like a strong drink before you leave?’ she asks, gesturing at the drinks table, although it is about 11am. We go into her office where one wall is covered with birthday cards, many of them, I note, depicting Elvis. (Her birthday celebrations – dinner for 910 at Chatsworth, staff and family only – took place shortly after the ‘long service awards’: Alan Shimwell, who has worked for Chatsworth on the farm and in the garden (60 years), was given a carriage clock; Henry Coleman, Debo’s butler (47 years), got a postbox; Debo herself (55 years) was given a bracelet. ‘My wife,’ Andrew replied. ‘Well, thank God it’s not mine,’ the man said. No…EMC… unfortunately your churlish comment shows that the ugliness resides with you. A very enjoyable read and looking forward to the memoirs being published. Wonderful article and such a special comment by Gabriella. When Deborah Devonshire walked into the little church at Dumbleton for Paddy Leigh Fermor’s funeral last year, it was electrifying. She was absolutely the last word in dignity and elegance, and her wreath of home-spun flowers and herbs for Paddy was simply beyond beautiful. I was recalling the event last week with Magouche Fielding (Xan Fielding’s widow) and said “she knocked the socks off everyone else”. Magouche replied “no one else was wearing any socks”. Yes, but the article isn’t about Diana Mitford. Mitford clan loyalty is endearing, but please, let’s remember that Diana was a fascist and anti-Semite till the end (she died in 2003). Ugly folks on the inside possessing money and clout.